Posted by M Bharath Bhushan in Congress, elections, fast, Identity, JAC, regionalism, Telangana, TRS. 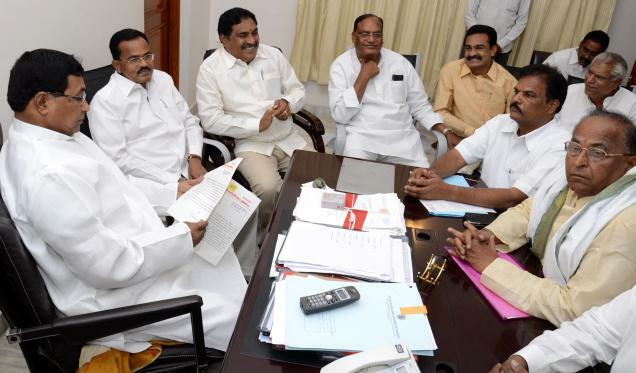 Telangana Telugu Desam and Congress MLAs may not rush through their resignations this time round till they get a firm assurance from Telangana Rashtra Samiti (TRS) on avoiding mutual contests if by-elections become inevitable. Posted by M Bharath Bhushan in agitation, Andhra, bandh, Congress, CPI, drama, fast, Hyderabad, Identity, Jai Andhra, Mulki, politics, Rayalaseema, regionalism, Settler, Sonia, TDP, TRS. HYDERABAD: Though this may give a fillip to the Telangana agitations, the UPA government is veering around to the view that a new state at this juncture is a strict no-no. The favoured opinion is to accept the sixth option formulated by the Srikrishna Committee, which is to maintain status quo while empowering the Telangana region by creating a Telangana Regional Council. Highly-placed sources told STOI that an announcement to this effect might be made after Parliament passes the finance Bill. But before any announcement, home minister P Chidambaram will hold another all-party meeting with the 8 political parties concerned to forge a consensus on this option, the sources revealed.